Taroko Gorge is a beautiful spot for camping, especially during the spring, summer and autumn, however being a mountainous region and a higher altitude (about 500 metres for Tianxiang) it can be significantly cooler than coastal Taiwan, and weather is prone to change rapidly, so be prepared. Bring plenty of warm clothes, and check weather forecasts first, and don't even think about coming if there's a hint of an approaching typhoon! While there are other campsites, if you're going to stay in the gorge I recommend staying near Tianxiang, as it's a beautiful little town, close to the Lushui and Baiyang Trails, and offers basic services like food and supplies. There are three camping areas around Tianxiang, all with toilets. In my opinion the Lushui campground, being a natural, tree-shaded field is by far the most pleasant, however you'll need to walk a few minutes to the Lushui Service Station for toilets and 600 metres to the Heliu Campground to use their showers. I can't really understand the idea of pitching a tent on wooden platforms, but if you want them head to the Heliu campground. 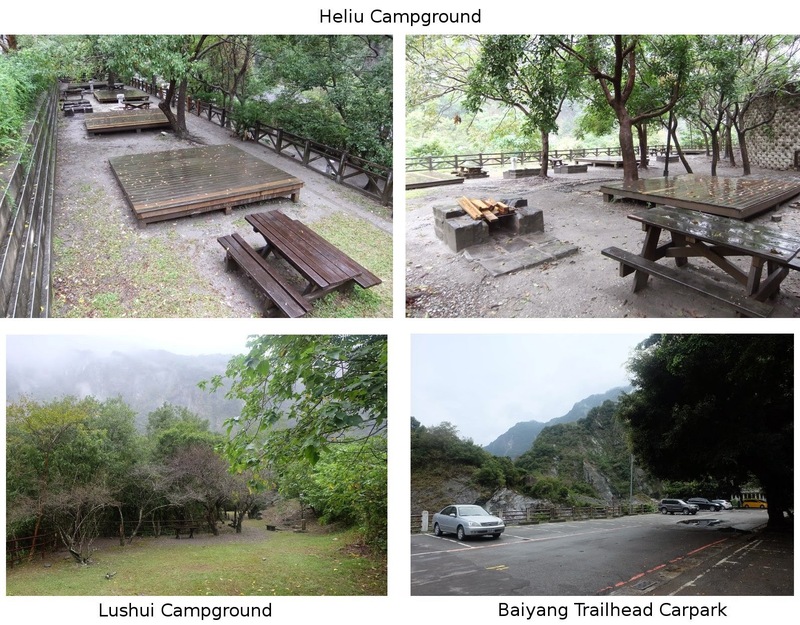 The Baiyang trail carpark is just that, and tents must be cleared by 10am to allow it to resume its intended purpose, mostly by large tour buses. It could be good if you just need to throw a tent up as you pass through the central mountain range or perhaps get a very early start onto the Baiyang Trail. The Lushui service station has a small cafe and gift shop selling overpriced drinks to tourists, and the Baiyang Trail Carpark is one kilometre from Tianxiang, but apart from these options you'll need to bring absolutely everything with you, and take it away again afterwards. All have water available, but I wouldn't recommend drinking it, at least without filtering and boiling it. Booking is not necessary at any of the campsites, but at the Heliu Campground someone will come to ask for the money.